As part of my 50 Shades of Data presentation, I talk about CQRS – Command Query Responsibility Segregation. The idea that you can have one or more read only data stores with data replicated from the master store where all data manipulation (commands) take place. In a different presentation, I introduce Apache Kafka and explain its concepts. In this article, these two topics come together, in a light hearted fashion. My starting point is the observation that what Kafka can do for machines or systems is very similar to what Twitter does for humans. Twitter allows decoupled communication to potentially large (or very small) audiences that you may be completely unaware of as tweet publisher. These consumers of your tweets of wisdom can be anywhere in the world, use any type of device and read your tweets at their leisure – long after you tweeted them. For now, Twitter retains the full history of tweets. Since most people understand all of this about Twitter, it seems like a good introduction of Kafka to start with Twitter. 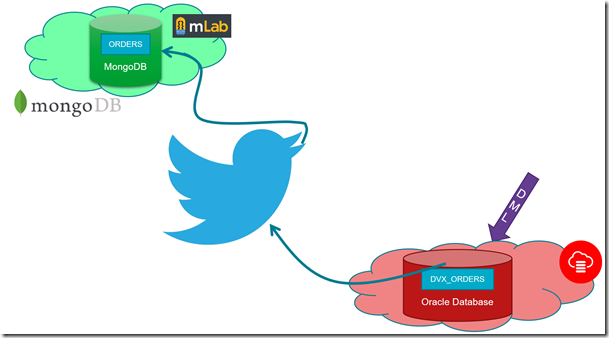 And then I demonstrate how one can implement CQRS using Twitter as middleware. A Node JS application is registered as a Twitter consumer – consuming Tweets with the hashtag used in the DML Tweets; this application consumes the Tweet, interprets the JSON payload and replicates the data manipulation on a MongoDB database, running in the mlab cloud. With all this in place, I can create Orders in the Oracle Database and I will see them replicated in the MongoDB database – through the tweets that relay the information. 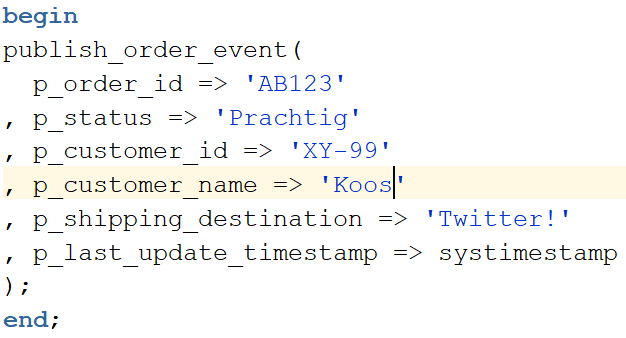 Note: by publishing my own Tweets with the hashtag and a meaningful JSON structure, I can also trigger the code that performs the manipulation of the MongoDB database. The relevant code for this article is found on GitHub: https://github.com/lucasjellema/groundbreaker-japac-tour-cqrs-via-twitter-and-event-hub . This includes DDL scripts for the Oracle Database, two Node.JS applications, artifacts for containerizing the Node applications and for Kubernetalizing these resulting containers. The Node applications – either stand-alone or in a container or on a Kubernetes cluster – can run virtually anywhere, as long as the Oracle Database can make a call out to one of them (for example: if the Oracle Database is running on the cloud, then from that cloud you need to be able to invoke the endpoint for the Node application over HTTP). 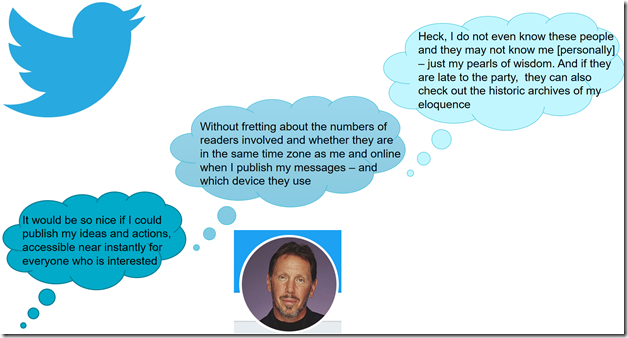 I am assuming an Oracle Database is already running somewhere (in my case on the Oracle Cloud as DBaaS – see for example https://www.oracle.com/webfolder/technetwork/tutorials/obe/cloud/dbaas/obe_dbaas_QS/oracle_database_cloud_service_dbaas_quick_start.html on how to get started with Oracle DBaaS). I also assume a MongoDB database is available to me. One quick option for MongoDB is MLab (https://mlab.com/) – a MongDB hosting service with free tier up to 500 MB. In this article I will use the straightforward approach with a Table trigger, to be triggered for INSERT operations (to keep the example simple). I am well aware that the right thing to do in the trigger is to schedule a job with dbms_job or dbms_scheduler. Only when the change that excited the trigger is actually committed will the job be executed. The job is to make the HTTP call to inform the Node application of the database change. To further simplify this article, I will forego the job and simply make the HTTP call when the trigger is firing. In order for [PL/SQL program units owned by] a database user to make HTTP calls, they need to have been granted specific permissions – including permissions to call out to the specific endpoint. The statements to be executed as a DBA can be found in this file: https://github.com/lucasjellema/groundbreaker-japac-tour-cqrs-via-twitter-and-event-hub/blob/master/db-synch-orcl-2-mongodb-over-twitter-or-kafka/database/sys-prepare-ddl.sql , using the DBMS_NETWORK_ACL_ADMIN package. The DDL statements that create the table, a trigger and a PL/SQL procedure to make the HTTP call are in this file: https://github.com/lucasjellema/groundbreaker-japac-tour-cqrs-via-twitter-and-event-hub/blob/master/db-synch-orcl-2-mongodb-over-twitter-or-kafka/database/oracle-ddl.sql. 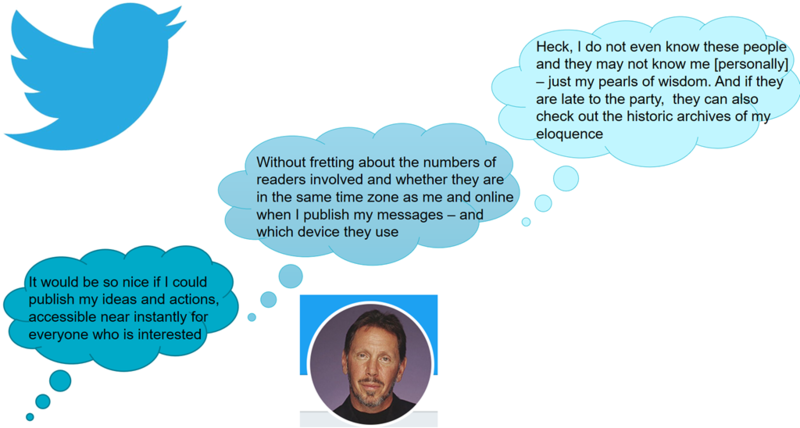 The most interesting snippets are included below. Note: I had some difficulties with making a POST call and instead of resolving them I took the easy way out and used an elaborate GET request to make my intent known to the Node application. The Node application is again a simplification – and not at all production ready code nor even a very efficient implementation. It will do the job. Not much more. The Node application uses Express to handle HTTP requests. See file https://github.com/lucasjellema/groundbreaker-japac-tour-cqrs-via-twitter-and-event-hub/blob/master/db-synch-orcl-2-mongodb-over-twitter-or-kafka/index.js for the core module. The application handles GET requests on the /about and the /order endpoint. The former returns a simple response which can easily be used as health check. The /order endpoint takes the URL request parameters from the request and invokes either a function to tweet about te new order or to post a message to a Kafka Topic. var twitterHashTag = process.env.TWITTER_HASHTAG || "#japacorderevent"
Note how the Node application does not contain any hard coded environment references – such as the Twitter Hashtag, the Twitter Client App credentials or any of the Kafka configuration details. All these values are derived from environment variables – that we will be able to set when a container with this application inside it is run or from the Pod configuration when we run the container on Kubernetes. The logic for publishing the tweet to Twitter is in the tweet module. The sources are found here: https://github.com/lucasjellema/groundbreaker-japac-tour-cqrs-via-twitter-and-event-hub/blob/master/db-synch-orcl-2-mongodb-over-twitter-or-kafka/tweet.js . 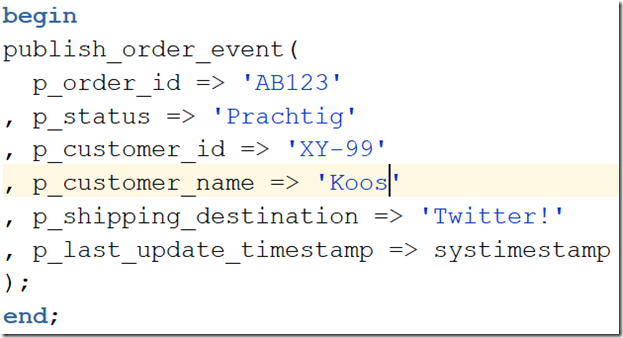 At this point, any insert into the ORDERS table in the Oracle Database should result in a Tweet being published with some JSON representation of the database change. 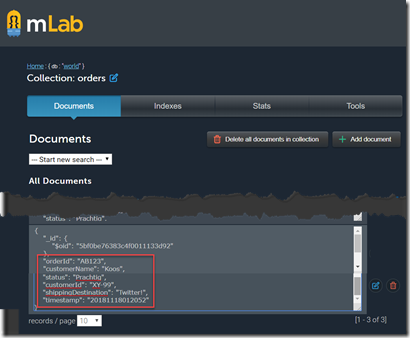 Part two of the story is about consuming the Tweet and using it to replicate the database change to the MongoDB collection. We assume the MongoDB instance with a database that contains this collection is already present. What needs to be created is a Node application that registers as a listener on Twitter for tweets with the specific hashtag we have chosen for our CQRS implementation. It should consume the tweets, interpret their JSON contents and create a record in the MongoDB collection. Eazy peazy. 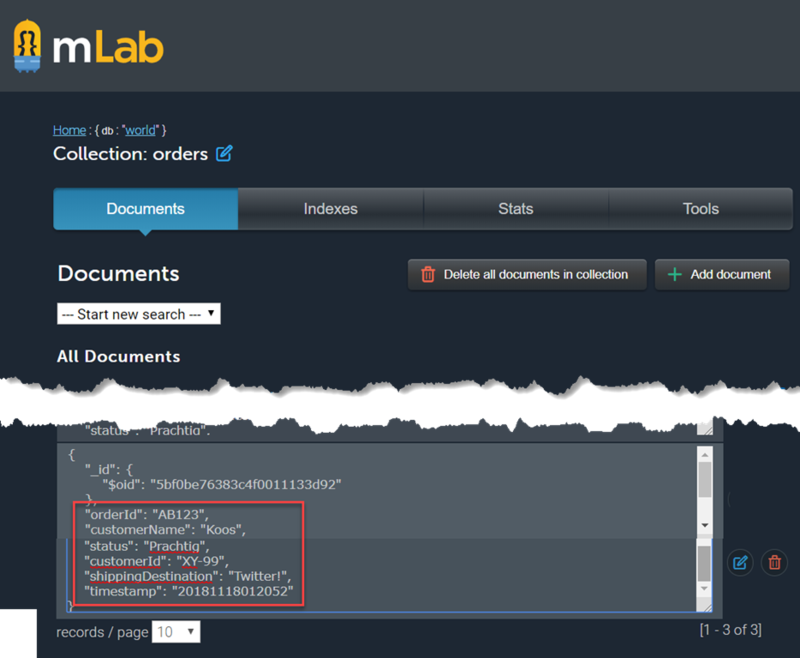 The OrdersAPI module (orders-api.js) receives the order object, connects to the MongoDB instance and database, inspects the current contents of the orders collection (not really necessary, only for demonstration purposes) and inserts the new order document. Note how all the configuration details for the Tweet Consumer (from twitterconfig,.js and tweet.js) and for the MongoDB manipulation (in order-api.js) are read from environment variables using process.env.<name of variable>. These variables can be set in the start script in de package.json file, or in the docker run -e name-of-variable=value-of-variable command used to run a container with the application inside or in the deployment.yaml file used to deploy the application to Kubernetes. Clearly, using Twitter as our messaging infrastructure, we are able to implement inter-cloud CQRS from Oracle Database to MongoDB instance. No mean feat! Source code for this article: https://github.com/lucasjellema/groundbreaker-japac-tour-cqrs-via-twitter-and-event-hub . MLab (https://mlab.com/) – a MongDB hosting service with free tier up to 500 MB.